Master feather artist Rick San Nicolas with his feathered cape and cloak. NPS Photo/Christa Sadler. An endangered pseudoorca (false killer whale) and her calf in Hawaiian waters. Courtesy of Dr. Robin Baird/Cascadia Research Collective. Momi Subiono with a handful of māmaki leaves. Courtesy photo. Keiki help collect plants seeds for Kahuku ‘Ohana Day. NPS Photo. Although Hawaii National Park was established in 1916, the dedication ceremony didn’t take place until 1922, and was held on the rim of Kīlauea caldera. NPS Photo archives. Keiki watch Hula Hālau Ulumamo o Hilo Palikū perform during a previous Cultural Festival. NPS Photo/Jay Robinson. Happy 100th Birthday to Hawai‘i Volcanoes National Park! Entrance is free, our gift to visitors as we enter our 100th year on August 1, 2016! Join park rangers, staff, volunteers and partners at the Kīlauea Visitor Center (KVC) at 9 a.m. for Hawaiian music by Kenneth Makuakāne, and “lava cookies” donated by KTA Superstores, also celebrating their 100th anniversary this year. The Hawai‘i Island Hawksbill Turtle Project team will share their latest discoveries about endangered honu‘ea, and the first 100 visitors will receive a free Hawai‘i Volcanoes National Park Centennial window cling sticker from rangers at the entrance station. Taking Root in the Community. As a gift to local community, the Friends of Hawai‘i Volcanoes National Park will give away 100 native seedlings each of koa and māmaki trees to local residents who want to give them a good home. The Friends will also provide information on native reforestation efforts. Part of the park’s purpose is to preserve native ecosystems for future generations to enjoy, and you can help. Plant a native tree to mark 100 years of Hawai‘i Volcanoes National Park, and watch the future grow. 1932 Administration Building (also called the ‘Ōhi‘a Wing, located between Kīlauea Visitor Center and the Volcano House). Artist-in-Residence Open Studio Returns. 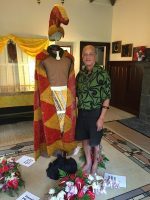 Master of Hawaiian featherwork, Rick Makanaaloha Kia‘imeaokekanaka San Nicolas, returns for his third year and invites visitors to join him in his open studio all month long. His featherwork replicates the work of ancient Hawaiian masters whose finely crafted regalia were worn by Hawaiian royalty and warriors. Supported by the non-profit National Parks Arts Foundation. Find Your Park on the Big Screen. Haleakalā on Maui, and Kīlauea and Mauna Loa volcanoes on Hawai‘i Island, were once the same park: Hawai‘i National Park. Discover Haleakalā National Park in the 51-minute film, Haleakalā: House of the Sun. Meet the dedicated rangers who share their knowledge and respect for Haleakalā National Park (established in 1961), its natural treasures, and the deep connection to Hawaiian culture perpetuated here. After Dark in the Park with Artist-in-Residence. Master of Hawaiian featherwork, Rick Makanaaloha Kia‘imeaokekanaka San Nicolas, the park’s Artist-in-Residence for August, will provide a public exhibit and lecture about his artwork, his inspiration from the sacred volcanoes, native birds, and the history and culture of Hawai‘i. Part of Hawai‘i Volcanoes’ ongoing After Dark in the Park series. Free. Lā‘au Lapa‘au: Hawaiian Herbal Medicine. Discover the healing properties of Hawaiian plants with Momi Subiono, who introduces their traditional medicinal uses. 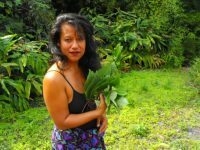 Momi creates natural herb products to help the Hawaiian community, with a goal to create a renewed awareness, understanding and use of traditional Hawaiian plants for healing. Part of Hawai‘i Volcanoes’ ongoing ‘Ike Hana No‘eau “Experience the Skillful Work” workshops. Free. After Dark in the Park: The Establishment of Hawaii National Park. Park Archeologist Dr. Jadelyn Moniz-Nakamura shares the story of the development of Hawaii National Park, and presents a fascinating look at the extraordinary individuals of the late 19th and early 20th centuries who were key in creating the national park that then included the summits of Kīlauea and Haleakalā on Maui. Centennial Hike: Walk into the Past at Volcano House. Take an easy walk with a park ranger to the historic Volcano House, and learn about the significant role this iconic lodge perched on the edge of Kīlauea caldera played in shaping park’s early history. About an hour. Kahuku ‘Ohana Day. Calling keiki 17 and younger to help park rangers restore the native forest by collecting and sorting new seeds in the park’s Kahuku Unit in Ka‘ū. Call (808) 985-6019 to register by August 5. Bring lunch, snacks, water, a re-usable water bottle, sunscreen, hat, long pants and shoes. Sponsored by the park and the Hawai‘i Pacific Parks Association. Enter the Kahuku Unit of Hawai‘i Volcanoes National Park on the mauka (inland) side of Highway 11 near mile marker 70.5, and meet near the parking area. Free. Oasis in a Desert Sea: Resident Whales and Dolphins of Hawai‘i. Join Robin Baird, book author and research biologist with Cascadia Research Collective, as he presents an amazing look into the lives of the resident toothed whales and dolphins of Hawai‘i. Dr. Baird and his colleagues have spent the last 17 years using photo-identification genetics and satellite tagging to present the clearest picture yet of these often misunderstood native mammals. Part of Hawai‘i Volcanoes’ ongoing After Dark in the Park series. Free. Four Fee-Free Dates for Founders Day. The National Park Service turns 100 on Thurs., Aug. 25, and is giving the public four days to celebrate for free! Visit www.findyourpark.com for parks near you. Nā Leo Manu Hawaiian Concert Series. Hawaiian music, hula and ‘oli (chant) open the fee-free NPS Centennial weekend, celebrate the 100th anniversary of Kīlauea Military Camp, and kick off the park’s 36th annual Hawaiian Cultural Festival & BioBlitz. At 6 p.m., Kumu Hula Manaiakalani Kalua and his hālau (hula troupe) perform, followed by Kenneth Makuakāne and his beautiful mele (songs), then singer and songwriter Mark Yamanaka caps off the evening with his original and classic Hawaiian songs until 9 p.m. In addition, the new Mele Ho‘oheno-Songs of Kīlauea and Mauna Loa CD will be released and available for sale. This CD of original Hawaiian songs was created by participants of the Haku Mele Hawaiian songwriting workshops in Hawai‘i Volcanoes National Park this summer, under the guidance of Kaliko Trapp-Beamer and Kenneth Makuakāne. Part of Hawai‘i Volcanoes’ ongoing Nā Leo Manu “Heavenly Voices” presentations. Free. 36th Annual Hawaiian Cultural Festival & BioBlitz. Themed E Ho‘omau (to perpetuate; to continue in a way that causes good to be long-lasting), the 36th annual Hawai‘i Volcanoes National Park Hawaiian Cultural Festival invites people of all ages to engage in authentic Hawaiian cultural practices and learn how native Hawaiians lived closely to the land as its stewards. Enjoy hula and music, watch skilled practitioners demonstrate their art, and try your hand at Hawaiian crafts. This year’s festival will again include a “BioBlitz,” a fun and hands-on opportunity to join scientists and cultural practitioners, and discover the biodiversity that thrives in the park. Register for free expert-led field inventories through the Friends of Hawai‘i Volcanoes National Park website. The BioBlitz field inventories run from 7 a.m. to 1 p.m., and the cultural festival is from 10 a.m. to 3 p.m. Visitors can learn about the importance of conservation and biodiversity through interactive exhibits at the festival. Free! These special Centennial events are made possible by the generous support of the park’s nonprofit partners, the Friends of Hawai‘i Volcanoes National Park, and the Hawai‘i Pacific Parks Association.